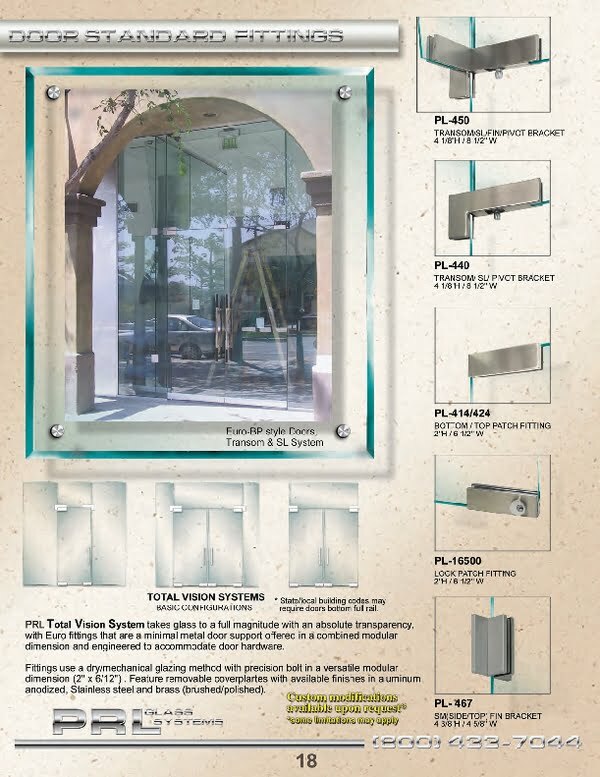 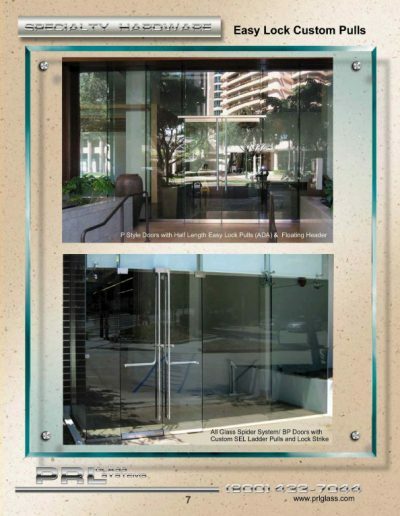 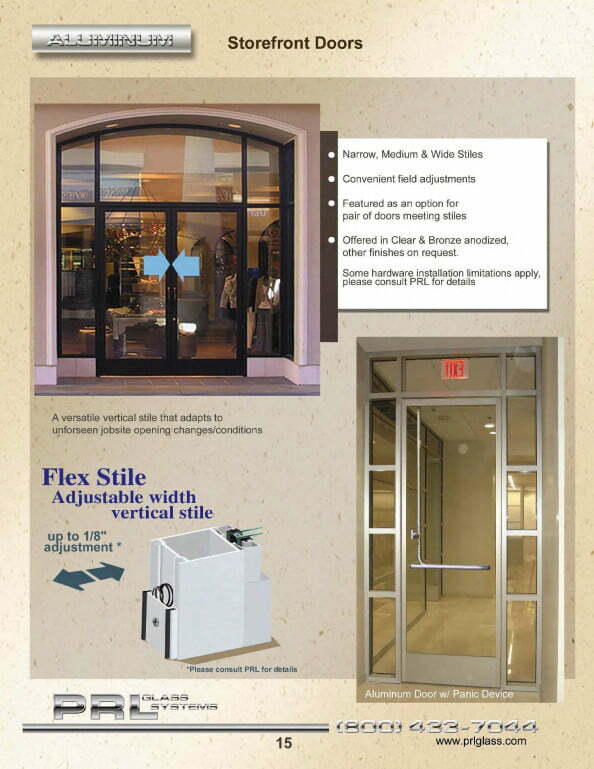 Total Vision Door Systems are created by using small but strong European patch fitting hardware to pivot the doors and hold glass panels in place. 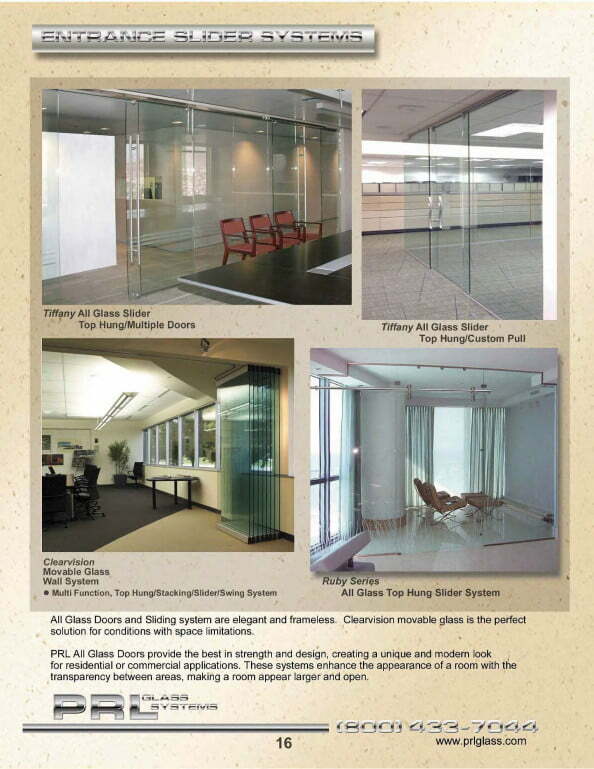 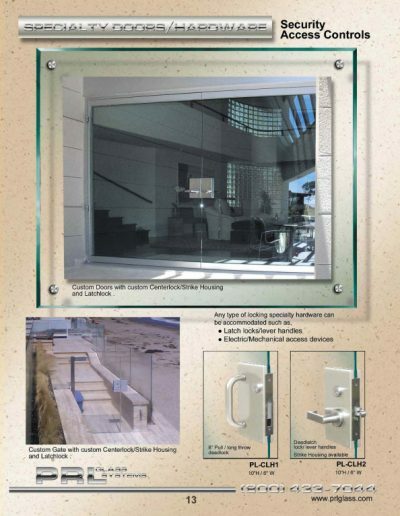 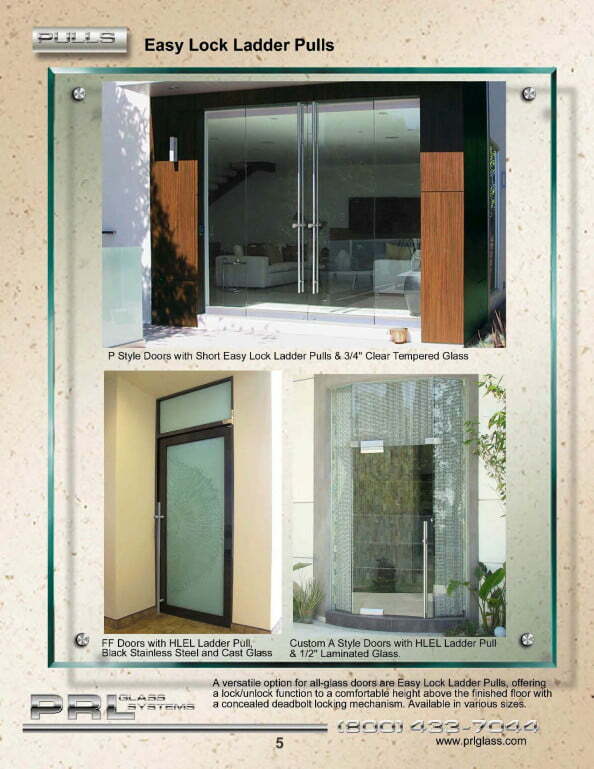 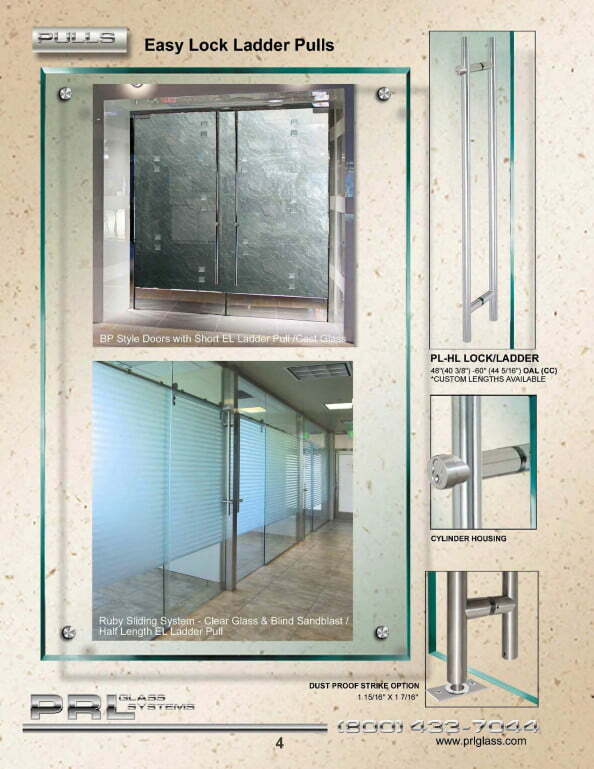 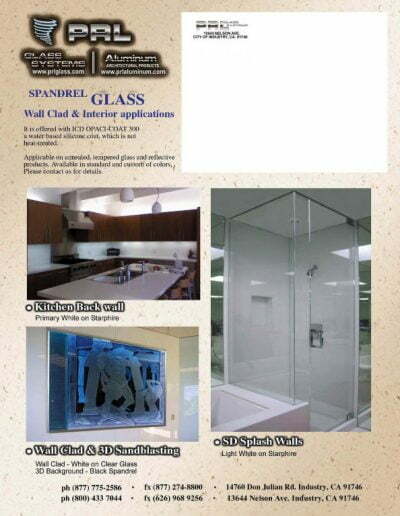 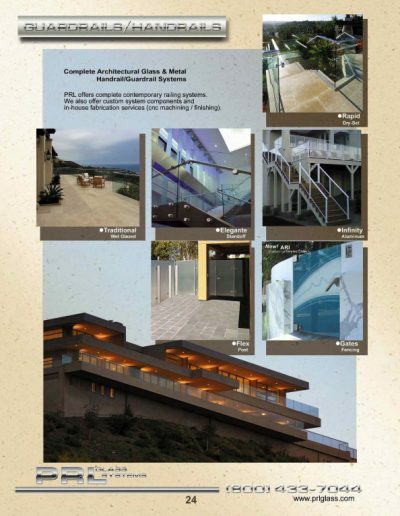 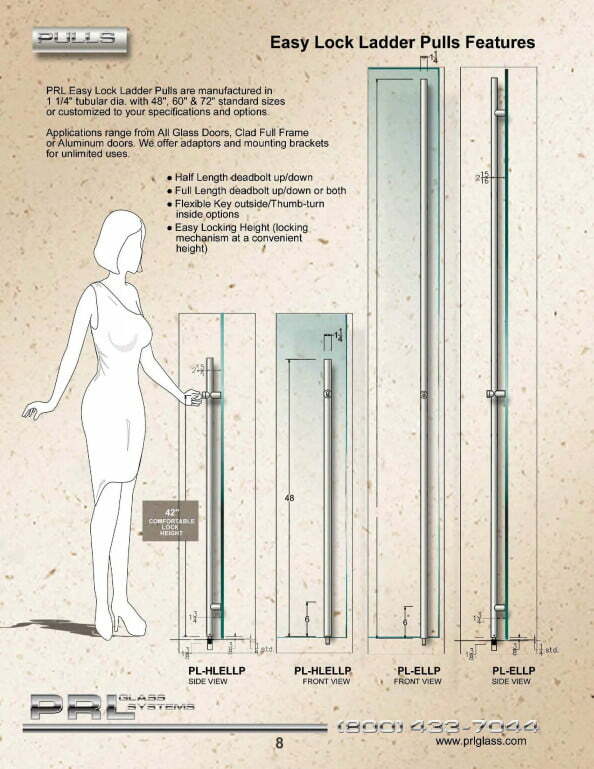 In this type of European hardware system, the glass is the structural element and the hardware serves simply to pivot the doors. 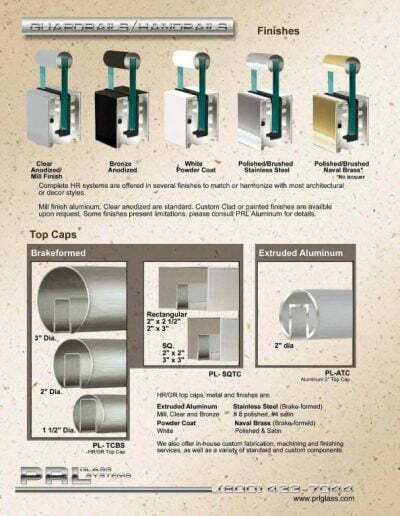 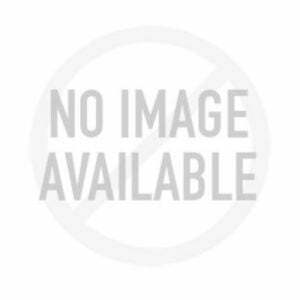 Our PL-400 series European style fittings are typically 2″ tall by 6-1/2″ long. 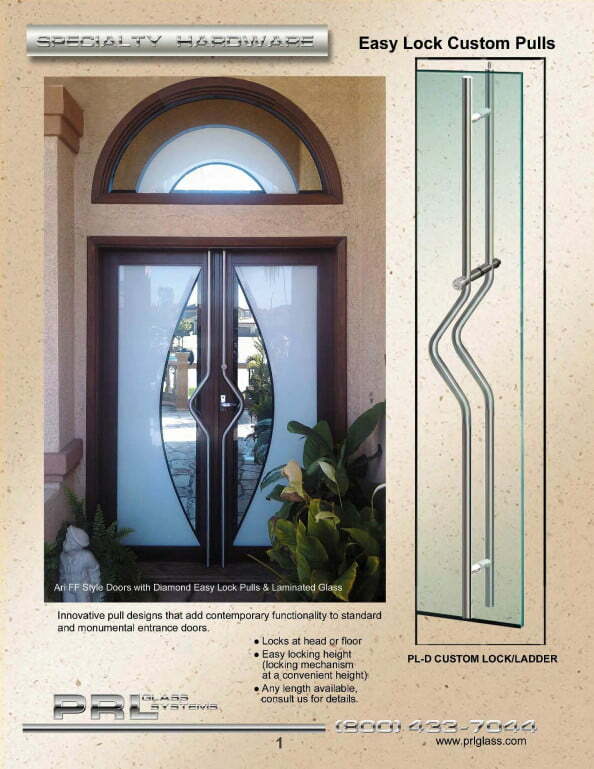 Available for use on the top and/or bottom of the door. 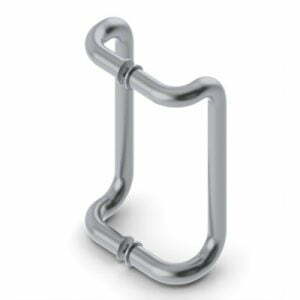 Top patch fitting hardware accommodate appropriate insert blocks to mate with a top pivot or overhead closer mechanism. Bottom patch fitting hardware accommodate appropriate insert blocks to mate with a bottom pivot or floor closer mechanism. When glass transoms are involved, patch fitting hardware is available for holding the transom to an adjacent glass sidelight panel or wall. 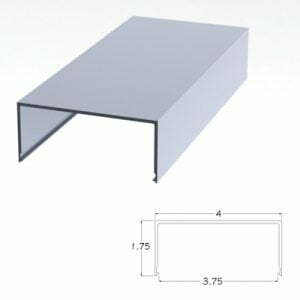 When glass stabilizer fins are required, European style fin support fittings are available to connect the glass fin to the pivot bracket and to the structural frame above. 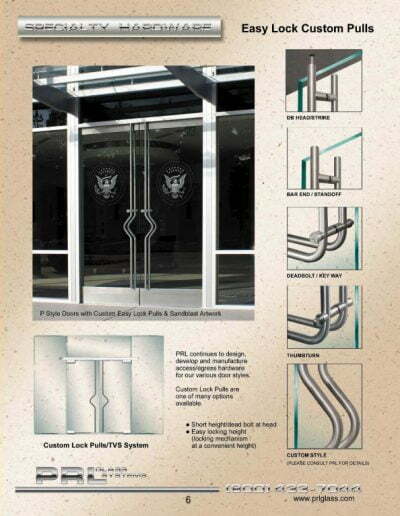 Patch lock fittings are available in the same profile size as the door fittings to maintain a consistent appearance. 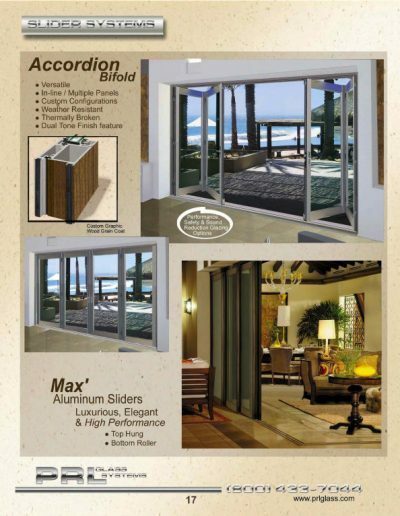 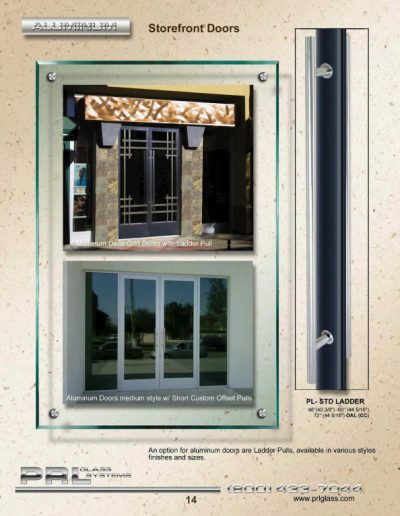 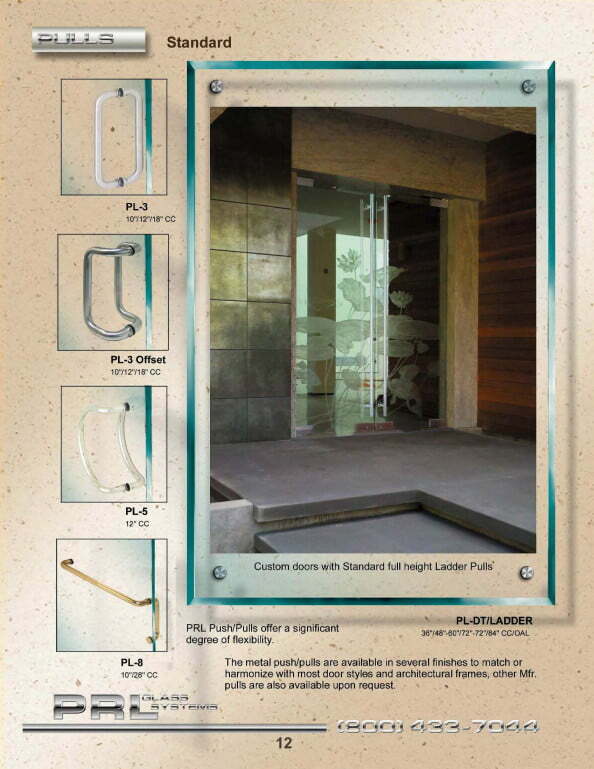 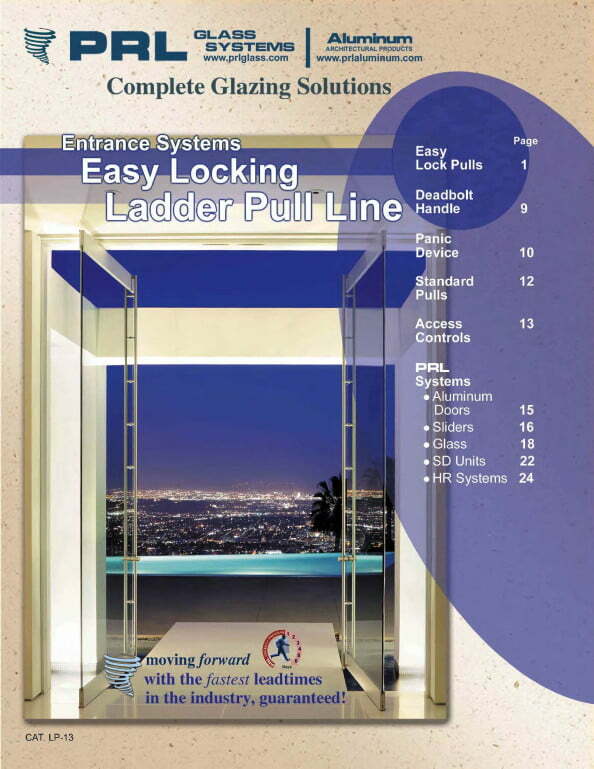 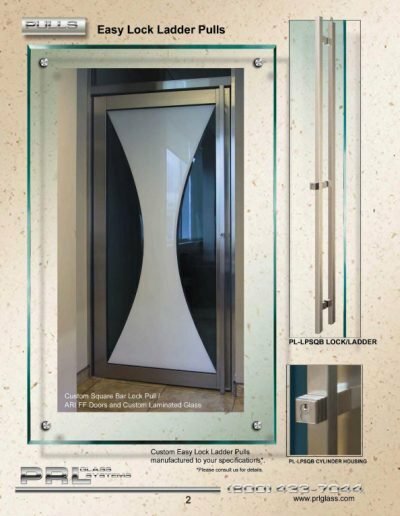 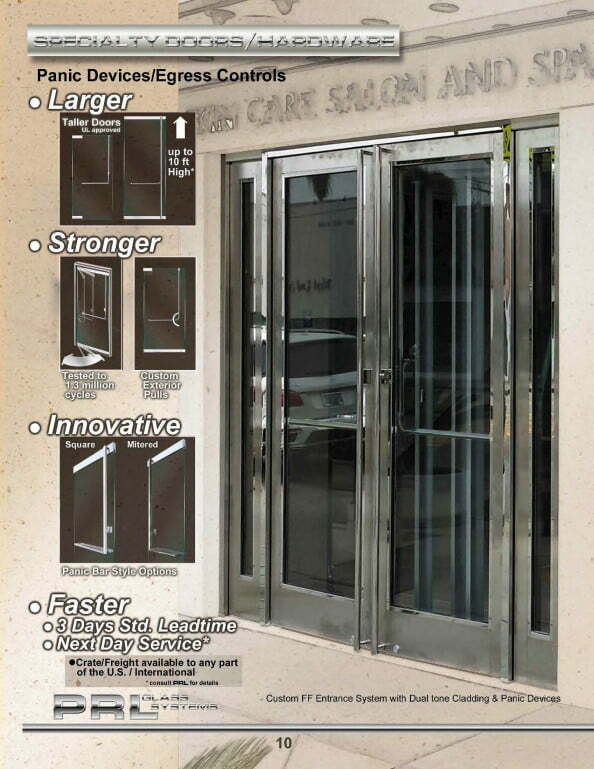 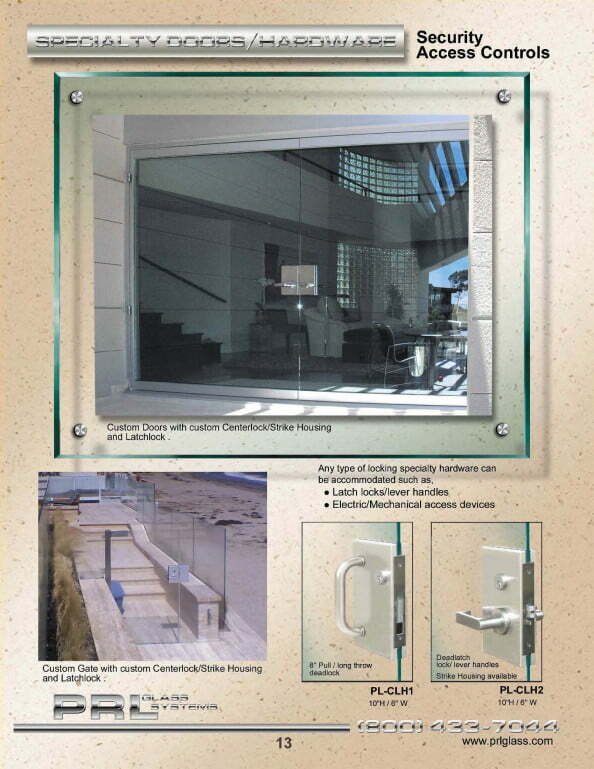 PRL stocks a full line of standard metal finishes in the PL-400 European style hardware. 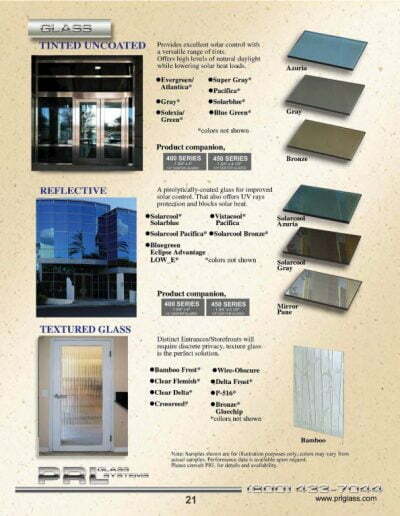 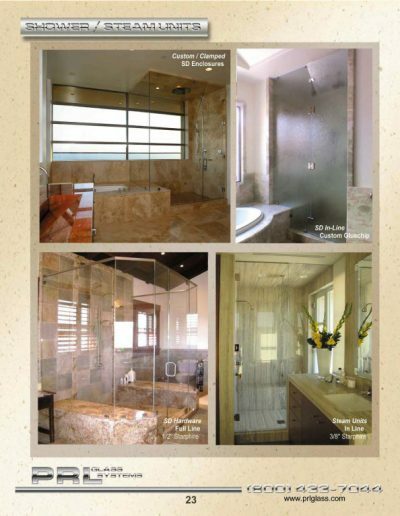 Bronze) and custom finishes such as painted or oil-rubbed. Although European patch fittings, when properly used are strong and capable of accommodating most standard opening conditions, thoughtful design considerations need to be used when specifying these fittings. 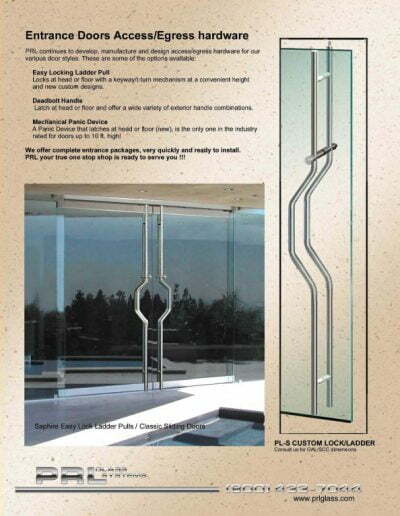 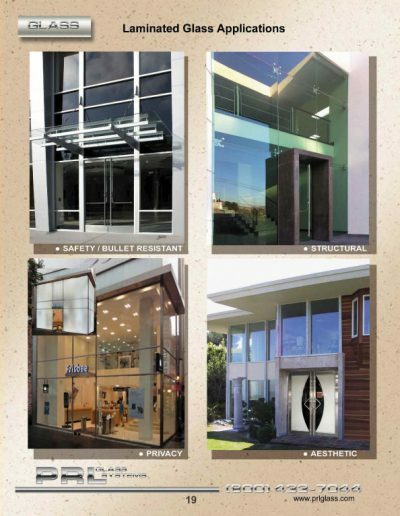 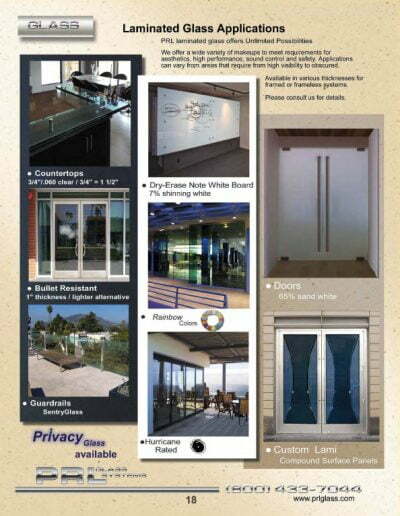 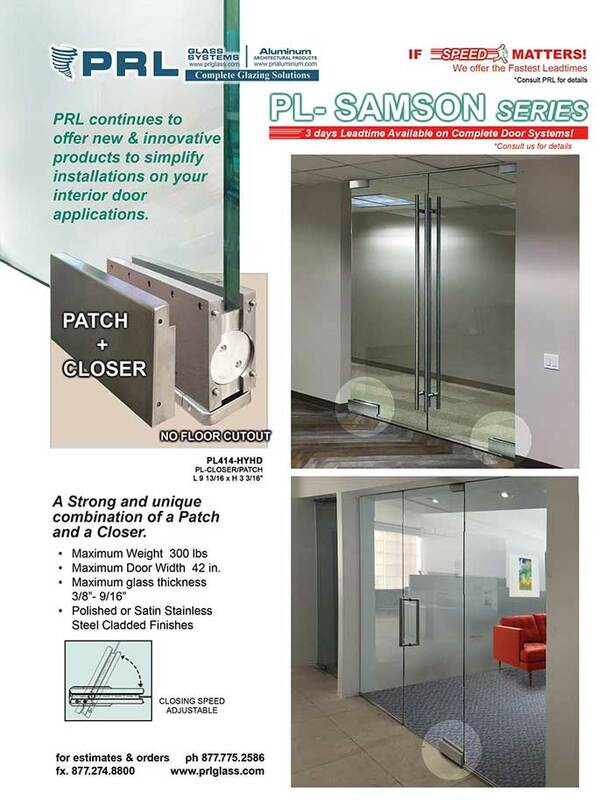 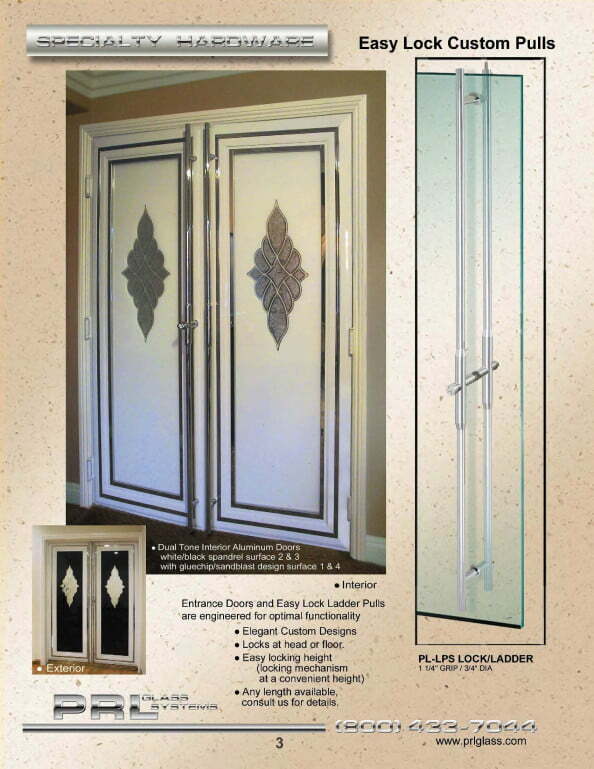 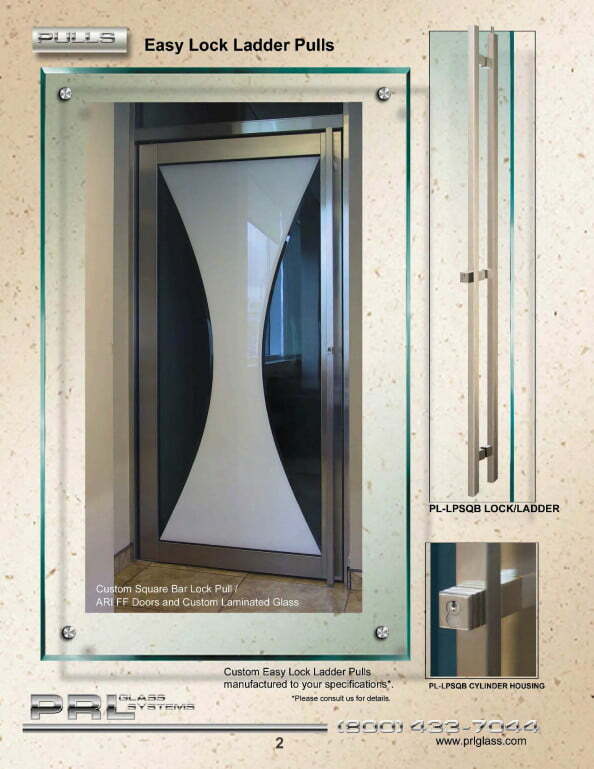 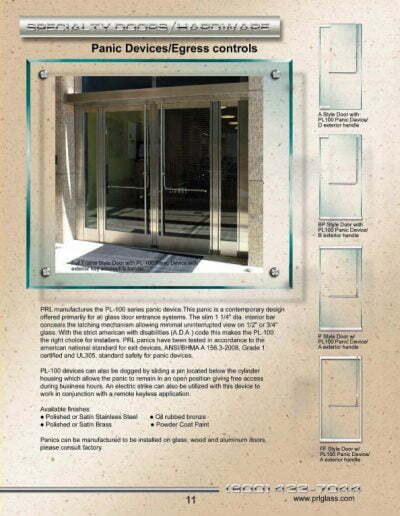 For over sized door openings or special configurations custom European style fittings can be manufactured by PRL. 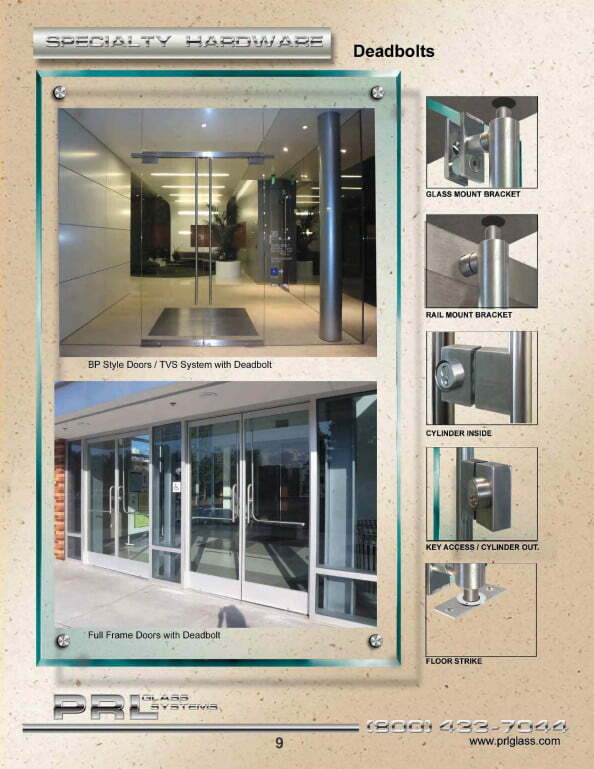 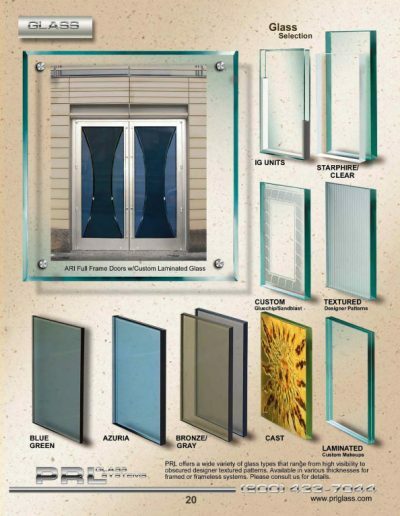 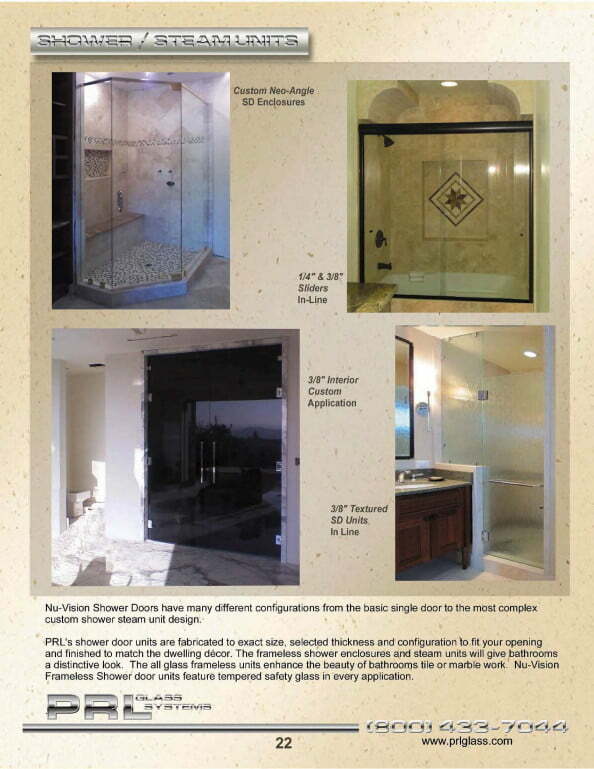 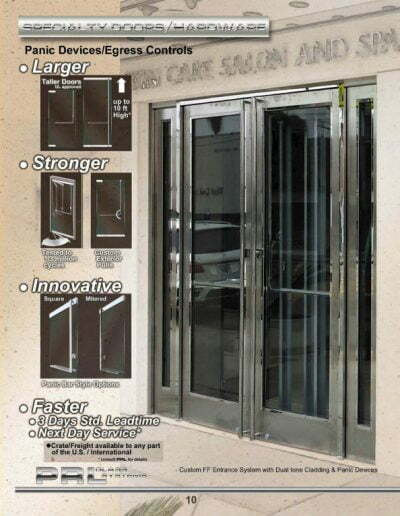 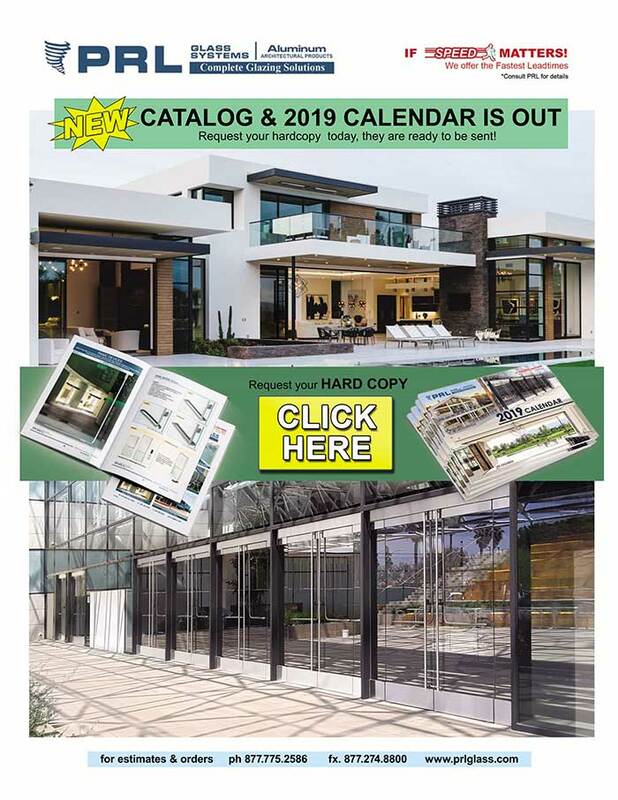 Please consult with our Entrance Door Department technical staff for assistance with designing your Total Vision System Toll Free 800-433-7044.